Exactly one year ago, I was mid way through a 24 hour labour and was soon going to meet the beautiful baby girl who is the Bo we know today. 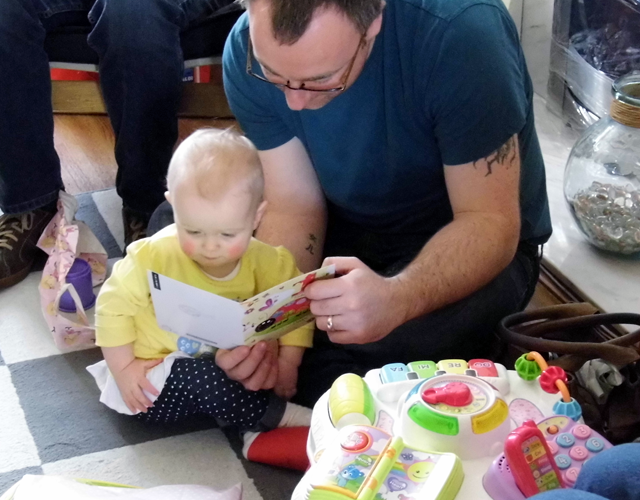 So, on Sunday, we celebrated Bo's first birthday in style and threw her a little family party. As there were nine of us who would be at the party on the day, we decided that it would be best to put together a small buffet so that people could grab as much as they wanted. We also wanted to include a range of food that Bo could also eat so that we didn't have to make anything separate for her and she could enjoy her party food as well. 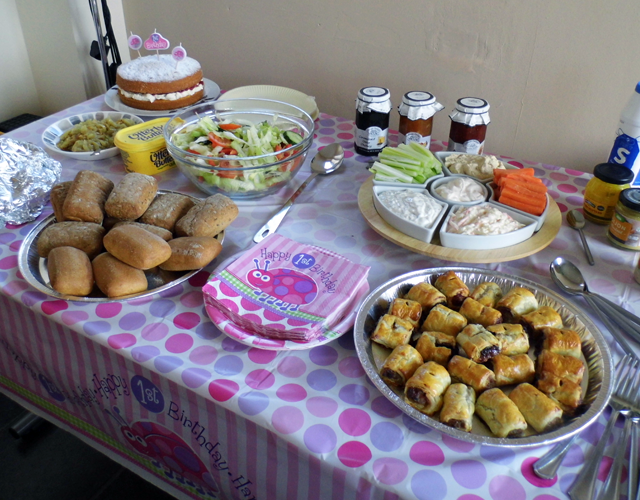 I say party food - the food we laid out wasn't exactly that. For the main offering we had a beef joint cooked in the slow cooker, cooked onions and some warm freshly baked (in that they were bought part baked from Morrisons!) gluten free buns. On top of this we had home made sausage rolls (with caramelised onion chutney, mango chutney or tomato chutney layered inside), a big salad and, finally, some carrot and celery sticks with a range of dips and houmus. 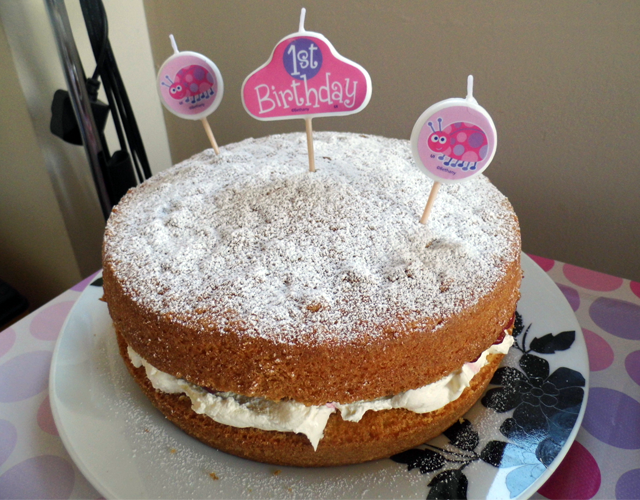 The cake, which you can see at the back of the table there, was also home made and was a standard Victoria Sponge with fresh cream and reduced-sugar raspberry jam. Initially we did try to put together a sugar free option for Bo (replacing the sugar with honey and apple sauce) but it's fair to say this was a disaster and, not being expert bakers at all, we decided to go for a safe option. As this was Bo's first birthday party and she wouldn't be remembering what happened, we didn't want to go too far with the decorations. However, with both myself and my mum buying a few bits and bobs, we ended up with a pretty pink table that had a matching set of pink paper plates (to save on the dishes! 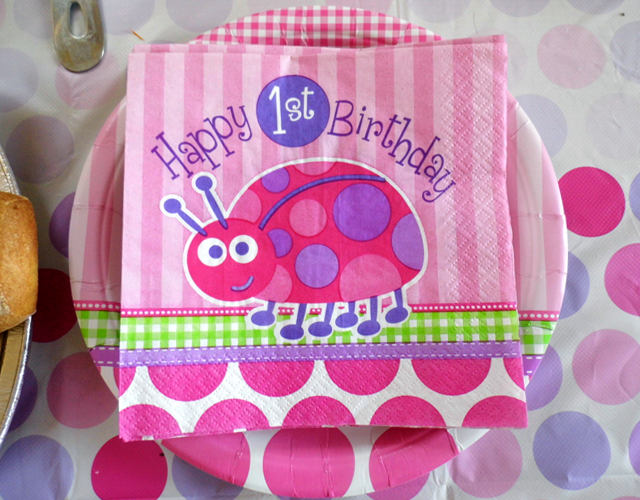 ), pink napkins, pink candles for the cake and a pink table cloth. 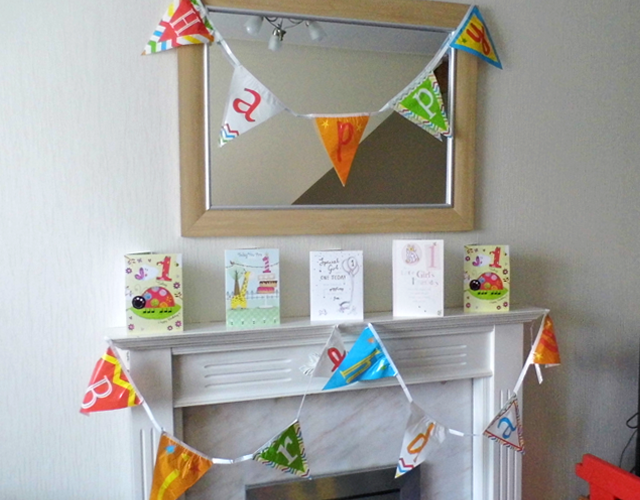 We also ended up with two birthday banners that were actually longer than our sitting room, resulting in us having to use only one and separate it onto different levels on the fireplace, which you can see in the image at the start of this post. We had invited all of Bo's grandparents to the party (she has three sets) so, not having the biggest house, we had done quite a bit of furniture shuffling in order to fit everybody in. The guests started arriving from 11am onwards and the time was spent watching Bo open presents, eating food and generally catching up with each other as a family, whilst I rushed around in the kitchen getting everything ready. I am pleased to say that everyone seemed to enjoy the food, and we got some really good feedback on the sausage rolls and the beef. I think we will definitely look at making some more of those sausage rolls for everyday use, as they only take 20 minutes to cook in the oven and are lovely and crispy. Bo had a wonderful time, at least that was the impression she gave us! 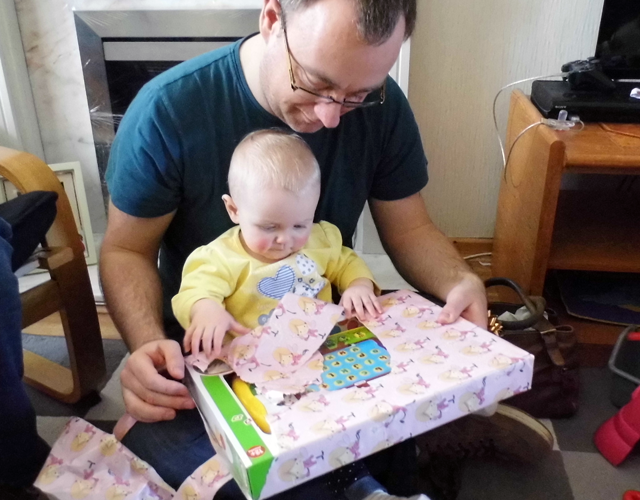 Her favourite part was opening the presents, which she dived at with gusto and then took her time unwrapping, delicately pulling one small section off at a time. 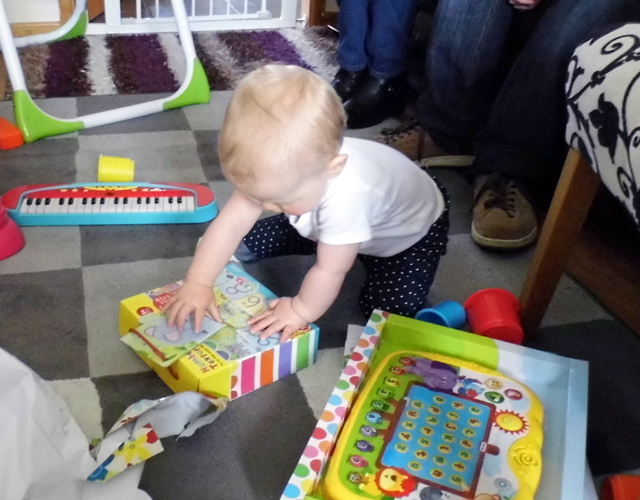 Once opened, the majority of the presents were played with for roughly five minutes and then her attention would shift to the box that they came in, keeping herself thoroughly entertained banging them and inspecting the designs on the outside. 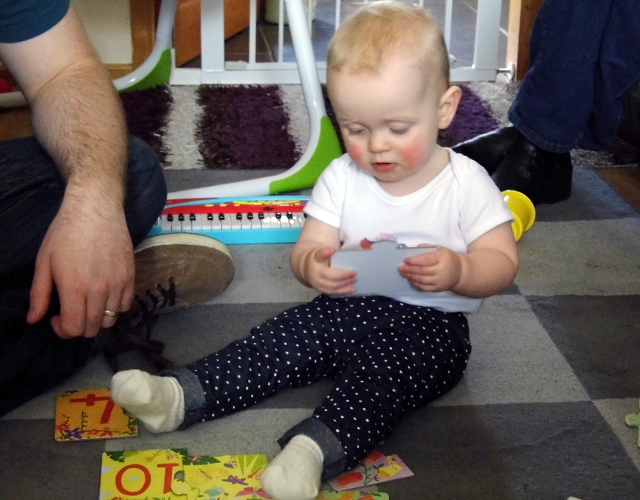 She also loved looking at the cards that people gave her which really surprised me, as I have always been of the opinion that it is a waste of time buying young children cards as they do not care about them. She has proved me wrong. Unfortunately, due to the excitement of people arriving earlier on, Bo missed her morning nap and therefore struggled with the idea of so many people being in her small little house as the day went on. However, she did very well and, despite a few wobbles here and there, she mainly held it together and could still be seen playing and giggling away until the afternoon. She held out long enough to eat some of her cake - which she did in the same, delicate manner as she opened the presents - and to wave most of the guests goodbye and then conked out on the sofa. If only it lasted all night, huh? Overall, I'm really happy with how the party went. The guests and, most importantly, Bo had a good time and it was nice for everybody to get together again as this doesn't happen very often. 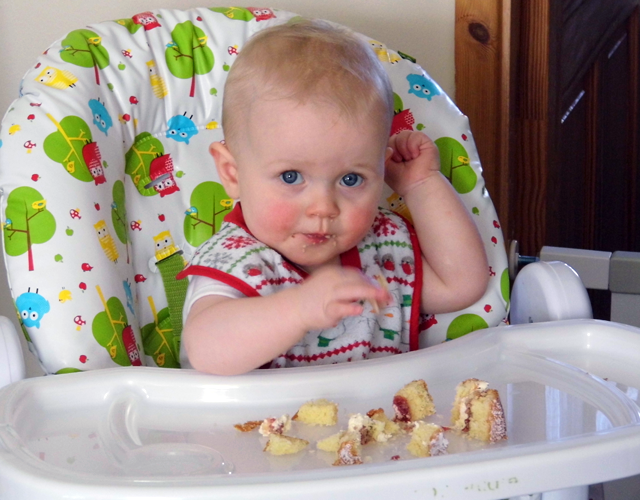 What did you do for your baby's first birthday? Let me know in the comments below and feel free to leave a link if you blogged about it! Now, I'm off to snaffle the last piece of birthday cake before she wakes up from her nap. 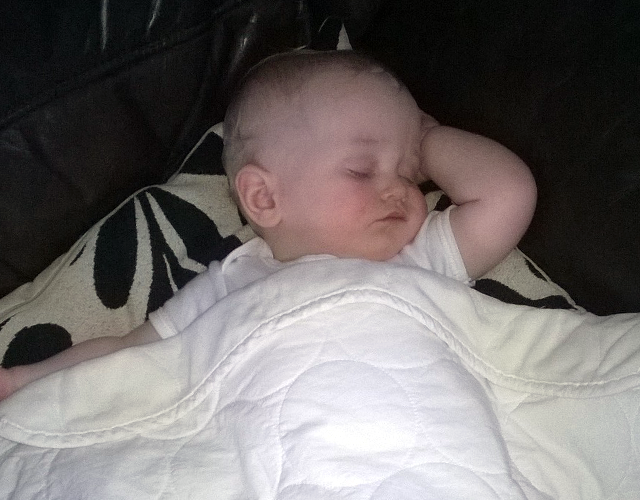 - The Mad Mid Week Blog Hop on the Super Busy Mum blog. 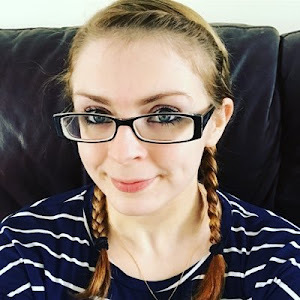 - The Blogger Club UK on the Mudpie Fridays blog. - The Family Fun Linky on the Diary Of An Imperfect Mum. I wasn't sure whether to since she wouldn't remember it but thought it would be nice for us to remember at least - and I can show her (and embarrass her) this post in the future. They were pretty epic.. stole the recipe from my mum! Might put a post up on how to make them here someday.